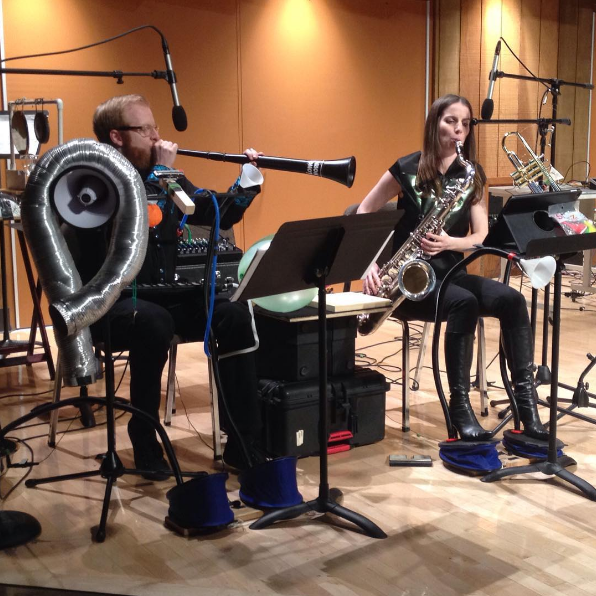 NTQ brings our University of Virginia residency to NYC! We’ll be performing new electroacoustic works by UVA student composers from our recent 4-day residency with them. Popebama and The Footlight present an evening of sonic exploration and various absurdities featuring Ridgewood and Astoria based artists. Featuring live instrumental performances, Popebama will perform new works by Queens-based composers Erin Rogers, Dennis Sullivan and Queens-born Paul Pinto, with early sets from Queens-based artists Stephe Cooper and Jessica Pavone. Festival at the University of Western Michigan. Looking At You (work-in-progress) is an immersive techno-noir, music-theater piece confronting the issue of privacy in our digitized society, and the question of how loss of privacy could transform us as a global culture. With a dynamic score for three saxophones, piano, and electronics—inspired equally by dance music, crime jazz, and operatic arias—Kamala Sankaram’s story of high-tech espionage lays bare these urgent questions. NTQ is excited to visit Gail Levinsky’s saxophone studio at Susquehanna University. We will present a masterclass on saxophone performance, an open rehearsal, and give a performance.